A diamond blade specifically designed and manufactured for cutting ceramics. When taking on a job such as tiling, whether on the walls or floors, it's the finish that really matters. A general purpose blade will chip, not cut neatly or accurately and will not last very long. 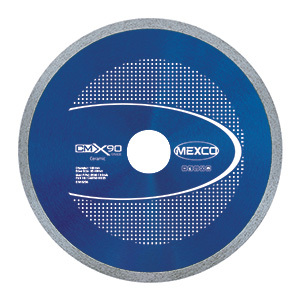 Mexco's diamond blade for ceramic cutting has been designed to give an excellent cut, have a low wear rate, but still be great value for money.